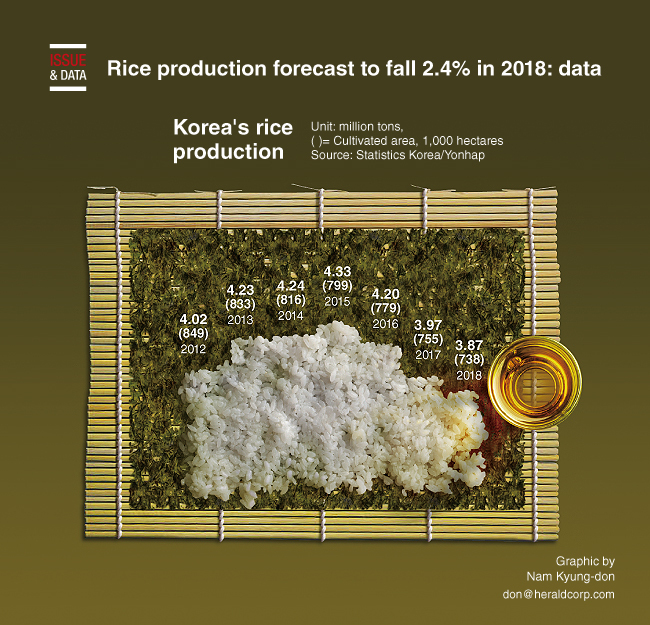 South Korea's rice output is expected to fall slightly in 2018 from the previous year due to bad weather conditions during the harvest season and a decline in rice paddies, government data showed. The country's rice production is forecast to decline to some 3.87 million tons this year, down 2.4 percent from a year earlier, according to the data compiled by Statistics Korea. The 2018 estimate is well below the five-year average of some 4.2 million tons. A total of 738,000 hectares of rice paddies were used to grow the staple grain this year, down 2.2 percent from last year.